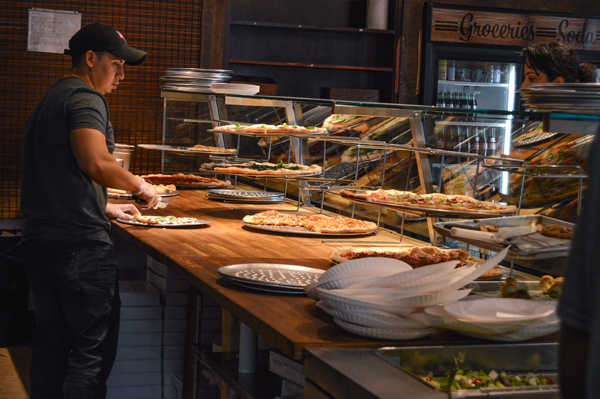 Wiseguys NY serves up traditional New York-style pizza by the slice. Take our nostalgia food tour for a taste of home in the District. Missing home a little extra? There’s no better cure for homesickness than a familiar dish, served right here in the District. California is home to some of the best Mexican cuisine, second only to actual Mexico. Although Surfside doesn’t serve a mean Mission burrito, their lighter take on Mexican – with copious use of grilled sweet corn, tahini sauce and pico de gallo – is both delicious and easy to eat. Not to mention, you can taste the freshness of their ingredients in every bite. Anything on the menu is delicious, but meat lovers should try the corn-and-steak Andros burrito ($10.95), and vegetarians especially will enjoy the Martha’s Vineyard mushroom quesadilla ($10.95). Extra points to Surfside for serving out of a literal shack, just like the real Californian hot spots do it. 1827 Adams Mill Rd. NW. This San Francisco institution recently opened in Adams Morgan as part of the third wave coffee revolution, much to the delight of West Coasters stranded in the District. Grab a strong cuppa from the brand known for their quality coffee, especially the trademark Mint Mojito ($4.50) or the Philharmonic ($3.50). True N.Y.-style, hand-tossed, thin-crust pizzas are hard to find outside the Big Apple, but Wiseguy’s does a surprisingly delicious rendition. The fact that Wiseguy’s is based out of New York also boosts its authenticity. Wiseguy’s uses an old school stone oven to cook its pizzas, resulting in that perfect blend of chewy crust and char, topped off with a bubbling coat of freshly melted cheese. Stay classic with a slice of Margherita ($2.99) or try the actual Wiseguy for a slice with homemade meatballs, three types of cheeses and margherita sauce ($3.99). If you’re feeling up for dessert, also try their Junior’s cheesecake for an extra taste of home. Wiseguy’s will be even closer to your home in D.C., as it is one of the vendors coming to District House this fall. The District of Pi uses cornmeal in their deep dish to create that satisfyingly thick and crunchy crust. Pi prides itself on its local craft beer selection, like its refreshing Great Lakes “Dortmunder Gold” lager (6.25) or its hoppy Stone IPA ($6.95). Students from the South can visit the Bayou for authentic Cajun fare, cooked by acclaimed chef Rusty Holman, and it’s only a five-minute walk from campus. The Bayou serves genuine New Orleans cuisine, like spicy roast beef po’ boys ($15), shrimp and grits ($21) and classic cajun chicken with mashed potatoes ($19). To stay true to not just the food but the culture of New Orleans, Bayou hosts live music on Friday and Saturday nights. Guests can look forward to nights filled with jazz or R&B, and the Bayou also occasionally invites pop, rock and experimental bands to its lively establishment.